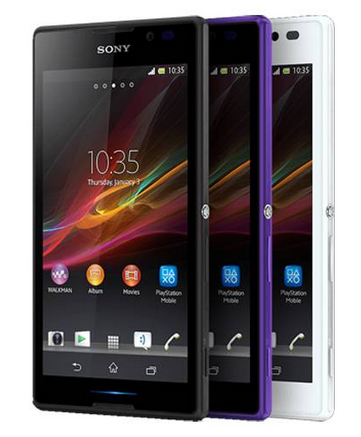 Sony Xperia C (Quick Review) which is the first Sony smartphone with MediaTek MT6589 processor is now available in India for pre-order at Rs. 20, 490 on online retailer Infibeam and Saholic. With Sony adopting the MediaTek processor we expected this phone to be priced more competitively in the range around 15k to 16 K INR. This phone is powered by a 5 inch Display with qHD resolution which will provide you a pixel density of 220 ppi which is not particularly impressive at this price range, where domestic manufacturers like Smart NaMo Saffron 1 are offering full HD display. The Sony brand of course is expected to surpass them in Build quality and after sales services. With this phone Sony has adopted the MediaTek MT6589 Chipset which has a 1.2 GHz quad core processor assisted by PowerVR SGX544 MP GPU. A RAM capacity of 1 GB will further assist this processor to provide smooth performance in day to day life with moderate usage. The storage capacity of 4 GB is disappointing at this price range. The storage can be extended to 32 GB using a MicroSD card. The Primary camera is of 8 MP Exmor R which is capable of Full HD 1080p video recording. The camera comes with features like LED flash, Auto focus, Geo-tagging, touch focus, Etc. With decades of experience in building imaging hardware from Sony, we expect this camera to sport good quality hardware and outperform the competition. A front camera of 0.3 MP is also present for video calling. The battery capacity is 2390 mAh which will provide you with ample talk time of up to 14 hrs on 2G and music play time of up to 111 Hours. Connectivity features include 3G HSPA+, Wi-Fi, DLNA, Bluetooth 4.0, GPS with AGPS support. This dual SIM phone runs on Android 4.2 Jelly bean Operating System and is significantly heavy at 153 grams. This phone definitely seems overpriced. The only thing to justify the price tag are Sony brand name, build quality and after sale services. Samsung devices like Samsung Galaxy Grand Quattro are also available at lesser price range. Amongst other manufacturers phones like Gionee Elife E5, Smart Namo Saffron 1 16 GB and Wammy Passion Z+ pose more impressive specifications. You can buy this phone from Saholic at Rs. 20,490 and also pre-order it from Infibeam, where you will also get Sony head phones worth 1,490 INR and accidental coverage.